Secretary-General António Guterres speaks to terror victim Sayad Mushtaq Hussaini (left) at a multimedia exhibition to mark the first International Day of Remembrance of and Tribute to Victims of Terrorism, NY, August 2018. Victims of terror attacks have an important and powerful role to play in combatting the “global menace” the United Nations chief said on Friday, launching an exhibition at UN Headquarters in New York to commemorate the first International Day of Remembrance and Tribute to the Victims of Terrorism. 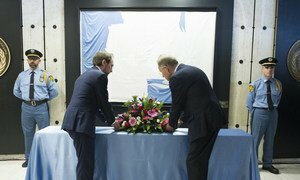 “We can all learn from those who have experienced terrorism,” Secretary-General António Guterres remarked, referring to the multimedia display mounted especially to mark the day, Surviving Terrorism: Victims’ Voices. “Communities around the world are demonstrating their resilience,” he declared, and “countering terrorism and violent extremism in their everyday lives, in their schools and in their places of worship,” he continued. “When we lift up the victims and survivors of terrorism, when we listen to their voices, when we respect their rights and provide them with support and justice, we are honouring our common bonds, and reducing the lasting damage done by terrorists to individuals, families and communities,” Mr. Guterres explained. Mr. Guterres pointed out that it coincides with the anniversary of the first time the Organization was targeted by terrorists, 15 years ago, when the UN Headquarters in Iraq was bombed and 22 people lost their lives, many of them UN staffers, including Special Representative and human rights chief, Sergio Vieira de Mello. “Earlier this year, I visited Mali, where terrorists threaten our peacekeepers and civilian staff on a daily basis,” he said, underscoring that although the survivors’ stories often go untold, they must, for their entire lives, live with the burden. “The United Nations stands in solidarity with you,” he concluded. One of the voices featured in the exhibition, Sayad Mushtaq Hussaini, shared his experience working as a journalist in Afghanistan last December, when an attacker detonated explosives during a panel discussion he was attending, on the protection of civilians. The terrorist attack on UN headquarters in Iraq in 2003 that claimed the lives of 22 people should serve as a reminder that the organization’s locally recruited staff often face the greatest dangers in the world’s most hostile places, amid increasing attacks on humanitarians, the head of the United Nations in Geneva said on Thursday.